The European Union Advisory Mission Ukraine (EUAM) this week completed a set of ground-breaking human-rights training sessions for staff of the Security Service of Ukraine (SSU) in Lviv, in the first of a series of regional training events envisaged by the Mission. EUAM is the first international organisation to implement the practice of human-rights training programme for SSU staff. Although standard practice in the security services of EU member states, Ukraine’s SSU has yet to institutionalise the practice of conducting periodic human-rights training. 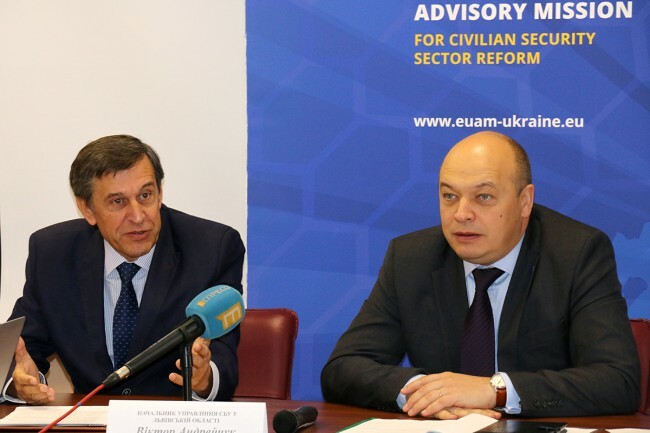 EUAM envisages that after further similar programmes in other parts of Ukraine, ownership will eventually be handed over to the SSU after a follow-up survey and possible adjustments. Ukraine currently faces threats to its state security and territorial integrity, which are unprecedented in the country’s independent existence. At a time in which the institutions entrusted with the security of Ukraine’s citizens are facing multiple challenges, it has become all the more important to ensure that SSU staff are able to conduct pre-trial investigations and security intelligence activities in accordance with human-rights standards. “Respect for human rights in intelligence gathering and investigations carried out by the Security Service is a key element for fruitful international cooperation with European security and intelligence agencies. We expect the SSU to be a trusted partner in information exchange based on respect of human rights and private information protection.”, said the Head of EUAM Kęstutis Lančinskas. “Human Rights is a cornerstone of every security service. It is our task to ensure national security, and protect national interests in the most critical areas. The implementation of this task requires the Security Service to take a series of special measures, most of which might involve a temporary restriction of human rights in cases specified by the law. And in these cases it is particularly important not to violate people’s human rights,” said the Head of SSU Lviv regional department, Victor Andreichuk. A total of 26 SSU staff from the Lviv regional department – as well as the regional departments of Volyn, Zakarpatia, Ivano-Frankivsk, Ternopil, Chernyvtsy, Rivne – participated in this week’s training. Similar human-rights training programmes are already being planned for Kharkiv and Odesa. The human-rights training is just part of EUAM’s recent support to the SSU. The Mission has also contributed to the effectiveness of SSU by developing its annual report, and drafting of Ukraine’s Concept on SSU Reform.